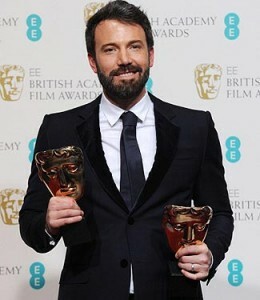 Ben Affleck Wins Main Awards for 'Argo' at Baftas 2013. 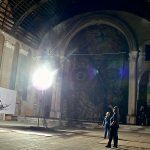 The Awards Season madness continues at full throttle with Oscar voting underway through Feb. 19 and the lush Academy Awards ceremony unfurling Feb. 24. Are you ready Seth MacFarlane? Like a Winter Storm Nemo-inspired blast of Awards Season news, only fluffier, the 2013 Grammys, the Baftas (British Academy of Film and Television Arts, or more simply, the British Oscars) and the USC Libraries 25th Annual Scripter Award, which recognizes the best adapted screenplay, all made for a weekend stuffed with awards ceremonies. Monday Morning awards pundits agree that Affleck’s Iranian hostage crisis drama Argo continues to build Oscar momentum with co-writers Chris Terrio, Antonio J. Mendez and Joshuah Bearman sharing the Scriptor Award. L.A. Times “The Envelope” reporter Susan King emphasizes the importance of the Scripter Award by pointing out that the past two Scripter winners, The Social Network and The Descendants, also won the Academy Award for best adapted screenplay. The awards momentum for Argo continues across the pond at London’s Royal Opera House with Affleck’s drama winning Bafta best picture and director awards. Reminding awards season pundits to always expect surprises, The Guardian reported that David O. Russell’s script for Silver Linings Playbook won the adapted screenplay prize and Emmanuelle Riva, star of the Michael Haneke drama Amour, beat out Zero Dark Thirty’s Jessica Chastain for the best actress prize. Finally, at the Staples Center in Los Angeles, home of the 55th Annual Grammy Awards, the British folk band Mumford & Sons won the album of the year gong for their second album, Babel. “We figured we weren’t going to win anything because the Black Keys have been sweeping up all day and deservedly so,” lead singer Marcum Mumford said on-stage. More interested in the Red Carpet Fashion courtesy of Taylor Swift and Rihanna than Grammy Winner Gotye? Well, CBS in addition to countless celebrity and fashion sites have you covered.